3D Six-Pack is a video transitions plugin for all versions of Windows, including Windows 8 and 10. Sorry, we have no Mac versions, but may soon! 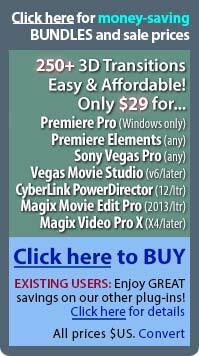 250+ Beautiful, Realistic New 3D Video Transitions for Premiere, Vegas, PowerDirector, and Magix Users! 3D Six-Pack transitions plugin for Adobe Premiere Pro/Elements, Sony Vegas Pro/Vegas Movie Studio, CyberLink PowerDirector, and Magix Movie Edit Pro/Video Pro is an affordable, easy-to-use video transitions plugin that adds 250+ terrific 3D transitions to the above video editing systems. The plugin provides better-looking, more realistic replacements to existing 3D transitions plus new 3D transition additions long-requested by users. From beautiful page turn transitions to life-like particle effects transitions to video transitions that look like wind, gravity or other natural elements are revealing the next scene, you get a wide range of high-end 3D video transitions at am amazingly low price. -- Download the DEMO of the 3D Six-Pack transitions plugin to try its 3D transitions on YOUR clips. 60 beautiful page turn transitions, peels, rolls & twists for wedding/family videos, etc. Realistic reflections, depth, motion, transparency combine to form superb high-end transitions. 51 flowing particle transitions and luminance particle drops (an original effect in dark/light areas), fountain particle pours, and realistic swirls and trails. Must be seen to be believed! 41 unique 3D distortions, twists, spins, stretches, swings. Subtle acceleration & transparency give a more natural look than other 3D transitions in your video editing software. 30 energetic particle transitions that realistically burst your scene or video text to reveal the next clip. Amazingly realistic particle motion with acceleration and fading. 30 naturalistic video transitions that use wind, gravity, or other organic progressions to reveal the next scene. Handy when you need an eye-catching transition that is 'real' and energetic. 40 additional transitions too cool to leave out -- page-turn transitions based on particle motion, more particle fountains, random line transitions, and very cool accelerated slides/squeezes! Are you a "cuts-and-dissolves" video editor who doesn't use many video transitions? Keep in mind that 3D Six-Pack is ALSO very handy plugin to reveal/disintegrate video text and video titles, lower-thirds, etc. (See examples below.) How do you apply the plugin to those video elements? It's easy... drop the 3D-Six-Pack transitions plugin onto the head or tail of a title clip in your timeline, instead of between two overlapped video clips like a usual video transition. (In Sony Vegas Pro or Vegas Movie Studio, overlap a title event with an empty event in a video track, then drop the 3D Six-Pack video transition onto that overlap.) COOL! Note: Are the above animations not playing in your browser? Make sure your Zone Alarm or Norton Internet Security settings allow animated-gif files to play. Still have problems? Check your browser settings. As an alternative, right-click any image above, then choose "Save Image As..." to save it your computer's hard drive. Then double-click it from your drive to play it. Yes. 3D Six-Pack is partially hardware-accelerated. Therefore, a DirectX 9 (or later) compatible graphic card is required. Even if you know you have that, we strongly recommend you check your system before buying by downloading our small 3D Six-Pack Player. (Here's the zipped Player in case your browser's security software prefers that.) It will quickly show if your system is compatible when you click the DepthFX or PageFX section in the 3D Six-Pack window. Some users have a compatible-sounding card, for example, but the card or its driver does not fully implement DirectX. The demo shows an X over the 3D video transitions. Upon purchasing, the X disappears. No need to reapply the same 3D Six-Pack video transitions in your project -- saving you time. I already have some 3D video transitions... why should I add 3D Six-Pack? 3D Six-Pack's 3D video transitions feature natural reflections, accelerated motion, depth perspective, transparency changes, and other visual subtleties that make the 3D transition appear much more compelling and realistic... and thus more useful in video productions when you want 3D looks. What happens if someday my computer crashes and I lose the downloaded file or serial #? Our license allows use in two different computers by the same user (such as a laptop "for the road" and a desktop at home) IF the two computers are not used AT THE SAME TIME. To edit on two computers simultaneously, such as for a video production business, a HALF-price second license is available from us on our special order form for new users (or our upgrade form for users who have already purchased 3D Six-Pack). 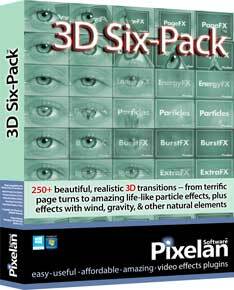 How can I buy 3D Six-Pack as a gift for someone else? It's easy -- use our special order form. On the date you specify, they will receive an email from us with their download info and no price shown. You can even enter a custom message that will be included in the email. What is Pixelan's return policy for 3D Six-Pack? Most plugin companies insist downloadable products may not be returned under any circumstances. After all, there is nothing tangible to 'return'. At Pixelan, your happiness and satisfaction is very important to us and we treat you as a long-term relationship, not as a one-time buyer. Therefore, if you somehow become unhappy with your purchase within 10 days, we will do our best to resolve it to your satisfaction. Your best protection is to be proactive -- to download and try the 3D Six-Pack Player or DEMO before buying to see if this plugin will meet your creative needs and it is compatible with your computer. The demo is easy to install and is identical to the purchased version but shows an X over its output. Installing your purchase will automatically remove the X and uninstall the demo, or you can manually remove the demo anytime via your Windows control panel.